BlitzWolf Latest Selfie Stick Tripod with Remote Control is more than your usual selfie stick, the BS3 is a versatile mini tripod, table top tripod and selfie stick. You can separate the controller from the stick and enjoy portable shutter control. Setup the tripod, slide out the controller and you can snap selfies at a distance. The Wireless Remote Control is easy to pair and operate, all you need to do is pair to your phone and press the button to capture a shot. The included 65mAh rechargeable battery can capture up to 50000 selfies. The head of the selfie stick can rotate a full 360 degrees for capturing the perfect shot. The clamp can also be rotated up to 270 degrees. We built the BS3 to fit almost every device with a 3.6-6 inch screen and the remote control requires no extra APP. Built with aluminum alloy and rubber, the BS3 is lightweight and holds steady in your hands. The tripod stand also has added rubber support for extra stability. 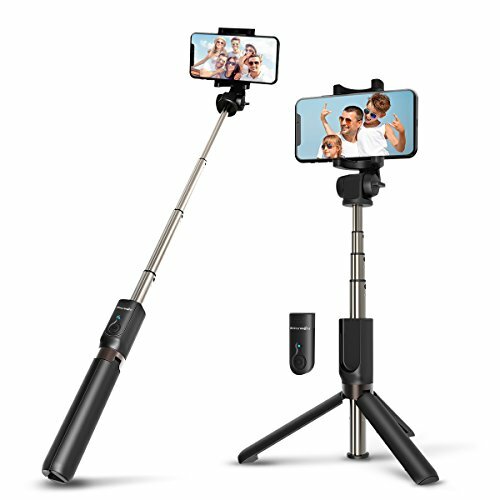 【SELFIE STICK TRIPOD WITH BLUETOOTH REMOTE】 -- 2 in 1 selfie stick tripod with built-in Bluetooth remote (max:33ft ), allows you to take selfie-photography or you could separate the controller to take group photos like parties, graduation, wedding, travel. 【65mAh LITHIUM BATTERY & NON-SLIP FPPD PAD & ALUMINUM ALLOY】-- Internal 65mAh rechargeable lithium battery can capture up to 50000 selfies after full charge within 30 - 45 minutes, can power the selfie stick tripod keep working for 24 hours, last for up to 3 months in standby mode. life span: 50000 hours. Aluminum alloy tripod with non-slip foot pad that helps the tripod legs won't slide, so the tripod will be more stable to record video or face time with your family or friends by the remote. 【LIFETIME QUALITY CARE 】-- Comfortable ABS and PC material handle and aluminum alloy shaft selfie stick tripod packaged with micro charging cable, not only light but also corrosion resistant and strong. BlitzWolf awards 30 days money free back, 18 months seller warranty and lifetime dedicating support to assure your long-term enjoyment.